Anthony Elding has been released by Derry City. DERRY CITY have released striker, Anthony Elding from his contract this morning with manager, Peter Hutton insisting it just ‘didn’t work out’ at Brandywell for the Englishman. 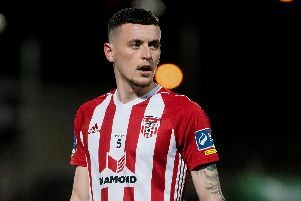 The 32-year-old had signed with the ‘Candy Stripes’ last February until the end of July with an option of extending his stay at the Brandywell after that time, however, his short stay at the club was cut short two weeks before the summer transfer window opens. Elding scored just two goals (both against Drogheda United last March) in 11 appearances for the club, his last appearance coming in a 1-0 defeat to Shamrock Rovers back in May 19th. “I’m sorry to have to let him go but it just didn’t work out. Anthony relies heavily on wingers but we had to make the decision to let him go,” said Hutton.